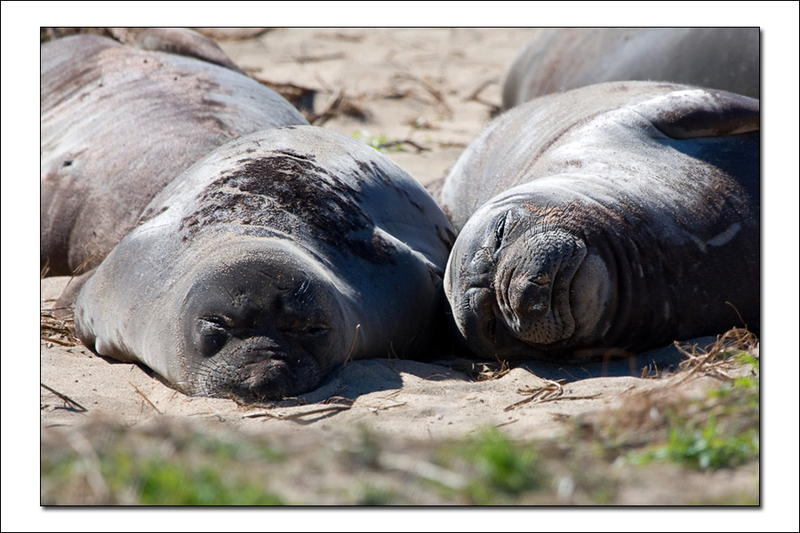 Our February hike will be a naturalist-guided walk at Año Nuevo State Reserve which features elephant seals in their natural habitat. This popular 3 mile walk, over rolling sand dunes, last about 2.5 hours and are considered moderately strenuous. This walk takes place rain or shine. Choose from AM (led by Bernard Kiriakos) or PM (led by Susan Kim) sessions. Each session has a capacity of 20 persons, including chaperons. Due to limited availability, sign up is open to scouts and 1 parent per family now. Remaining spots will be open to extra family members in a week on Jan 24th. The walk is $7 per person. Pay to Stella Lei by Jan 30th to hold your spots. There is no refund for last-minute cancellations, no-shows, or late arrivals. Refunds are issued only when the Park cancels a walk. Be prepared for sunny, windy, rainy conditions, as well as muddy trails. Layered clothing, sturdy shoes. Use sun screen, hat, hooded rain gear as appropriate. Bring bottled water for drinking as there is none available during the walk. No smoking or eating is allowed on the walks. Pets are not allowed in the Reserve and cannot be left inside parked vehicles in the parking lot. No kennels are available. Please make provisions for your pets. Bay Bridge Center Tour – Save the Dates! Award: Webelos can use this event to help achieve the Engineer activity pin. The Bay Bridge is currently being rebuilt and we have been offered an awesome touring opportunity of this monumental part of history. Steve Padilla from Bay Bridge Seismic Safety Projects will give us a tour at the Public Information Office (PIO) in Oakland during the winter school break on December 21st at 2:30pm. This 2-hour event will all be conducted at the PIO. We WILL NOT be walking on the Bay Bridge or taking a boat tour. Due to limited capacity (20 youths), priority will be given to scouts first. Look for an invitation email from me on November 10th. Reply to the email with your scout's name and the number of adults to sign up. No other evite will be sent. First reply first serve. Any spots not taken by November 17th will be open to siblings. Feel free to contact me with questions. Everyone enjoyed the ReadyPerson Training held at the San Ramon Fire Department. The Safety Officers presented the scouts with emergency situations and was able to review the proper procedure and response to the situations. It was a very enlightening and well taught session. Thanks to our wonderful Safety Officers, they made it fun and practical for the scouts. The scouts presented the Safety Officers their "Home Escape Plans" and in return was given an awareness kit courtesy of the Fire Department. By participating in this training and earning a "First Aid" patch, we hope our scouts gained confidence and awareness and will feel better equipped to deal with emergencies, although we hope that no one will have to. “A well-trained scout is a ready scout." P.S. Enjoy pictures on SmugMug. Den 11 is visiting the San Ramon Police Department and is opening up to the Pack. Scouts will learn about the responsibilities of the station, its personnel, and police equipment through activities that are both fun and educational. Most areas of the police station will be toured. Police patrol cars and K9 demonstration are available as well. Dress in Class B tee shirt. Reply by 2/19/2011. As always, parent participation is required. Contact Scott Spears if you have questions. Our Bear den 8 would like to invite all Pack 1776 Scouts to the ReadyPerson training for Scouts at the San Ramon Valley Fire Department on Thursday 1/27. If you are interested, let us know by this Wednesday noon. That is, you have slightly more than 2 days to reply. This is how much time the Fire Department will need to prepare material for everyone. The curriculum meets all requirements for the Webelos ReadyMan badge. It is also a great opportunity to fulfill a go-see-it requirement for the Tiger (2G) and Wolf (4F) ranks. As always, this is not a drop off event. Parent participation is required. More information of the program below. Send questions to John & Ammy Pluth. As part of the training program, all attending scouts are asked to complete a fire safety assignment BEFORE attending the class. 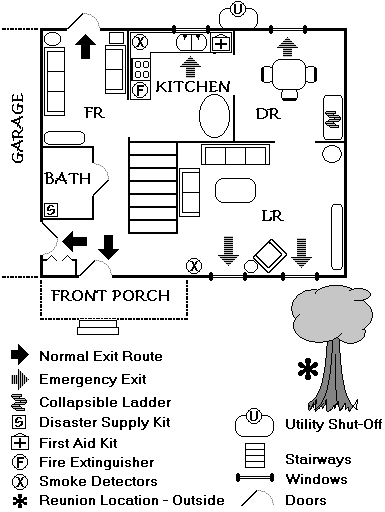 Please have each scout draw a fire escape plan for their home. The plan should include arrows showing the ways out of each room, their meeting stop outside the home, and for multiple story homes each floor should be mapped out separately. Graph paper is recommended, however, white paper is also acceptable. (See example here) Please turn these assignments in the day of the course. On the day of our class, we are going to gather our den in the parking lot and the den leader will let the staff know we arrived. The instructor will meet our group outside and guide the group to our classroom. Please remember there is no eating or drinking allowed during the training. Updated 2 (10/29/2009): Videos of this event posted HERE and HERE. Updated 1 (10/26/2009): Pictures of this event can be found HERE. A Golden Gate Raptor Observatory volunteer gives an hour-long talk about hawk migration, identification, and monitoring, complete with bird photos and examples of wings, tails, and talons. Then at 1pm, a newly banded hawk is brought up and shown to the crowd. A banding volunteer talks about GGRO’s banding program, and the hawk is released in front of the crowd. After the Hawk release, about 1:30, we'll take a very short drive to the Fort Cronkhite. We are going to meet at the parking lot at the end of Mitchell road. We will do about 1.5 mile hike around the Rodeo Lagoon. The hiking trail is rocky dirt, so it is NOT stroller accessible. On your own after the hike, you may visit Golden Gate Raptor Observatory Open House event at Fort Cronkhite until 4:00pm. There will be Scientific Displays, Radio-telemetry Demonstrations, Kid Crafts and Activities, GGRO 25th Anniversary Product Sales. From 101 south - Cross the Golden Gate Bridge and take the second exit Alexander Avenue. Get in the left lane following signs that read "101 San Francisco". Turn left at the stop sign and cross under the freeway. Turn right onto Conzelman Road and drive 1.8 miles to Hawk Hill. Park alongside the road before it becomes one way and then walk up the west side of Hawk Hill past the locked gate. It's just a few hundred feet to the summit.